Championship hurling is about results but there was little more for Oak Leaf fans at Owenbeg on Saturday to get enthused about. 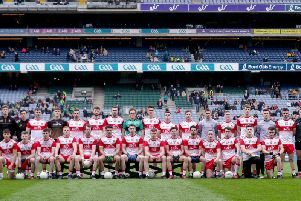 Derry did enough to set up a Christy Ring Cup Round 2A clash with either Kildare or London but manager Tom McLean will not have been fooled by this performance. This competition is Derry’s primary target this year but to make a serious impact McLean’s men need to get back to the standard of their early league displays and this was not it. In fairness conditions were horrible for both teams. The driving wind and rain proved a great leveller and when you go into a game as over-whelming favourites - as Derry did against Division 2B Mayo - there are rarely plaudits for victory. The most the favourites can ask for is to get the job done and move on, which Derry did but they will have to improve, notably in front of the posts. Defensively McLean’s team looked excellent with Sean McCullagh and Conor McSorley - operating in a sweeper role - superb among a back six in which there were only good performances. Even further up the field, there were passages of great play which deserved a finishing touch but too often the wrong decision, a misplaced pass or hesitancy saw potential scores disappear. Curiously, Mayo mirrored Derry’s defensive shape by employing Kenny Feeney as a sweeper despite enjoying the backing of the gale forced wind in the opening 35 minutes. Feeney was superb throughout and finished with 0-09, eight of which came from placed balls. Had he had more support from his team-mates this could have been a different finish. Derry limited JP Coen’s team to just three points from play but managed only six themselves with Ruairi Convery and, in injury time Na Magha’s Deaglan Foley, contributing the rest from frees. Jonathan O’Dwyer looked Derry’s most impressive forward, his three early second half points instrumental in clawing back the Mayo half-time advantage. Yet it was O’Dwyer who had Derry’s best goal chance on 65 minutes. The Banagher player found himself with a clear run on goal and substitute Tiarnan McCloskey in space alongside him roaring for a pass. The pass never came and before O’Dwyer could get his shot away, Feeney showed he was just as adept at defending as he was from frees with a brilliant last gasp tackle to stop the goal chance. It was that sort of day. Mayo were much better than their league form suggested. Coen had his team organised and motivated. Their 0-10 to 0-4 half-time lead came about from only 12 shots on goal and had they been slightly more aggressive in the opening half they could have given themselves more of a lead such were the conditions. Derry though, had chances first half as well. On 15 minutes, Convery’s good work sent Paddy Henry away but with the goal at his mercy he could only hook his shot over the bar for a point. The home side looked to have control of the game from the outset of the second half, O’Dwyer’s early points signalling a period of dominance as Convery (3, 2f), Alan Grant and O’Dwyer again brought the Oak Leafers level by the 50th minute with Mayo struggling to make any inroads at the opposite end. That should have been the signal for the Oak Leafers to go for the jugular, especially when Convery and O’Dwyer had edged them two points in front but Derry never convinced. There was a nervousness about their play which may have been left over from Wicklow’s shock league win but whatever it was ti allowed Mayo back into the game. The visitors hadn’t scored for 25 second half minutes but when that man Feeney hit the target again with 10 minutes remaining after working a short ‘65, it had everyone inside Owenbeg looking at the clock. Into injury time and Derry were nervously looking at the clock until Anton Rafferty superbly broke up a Mayo attack and Derry won themselves a free from which Foley was able to end the game as a contest. Room for improvement without doubt but, on a difficult day for hurling, Derry got the job done. They were indebted to a sterling defensive display if he can get his forwards firing again, Tom McLean has plenty of potential on his hands.